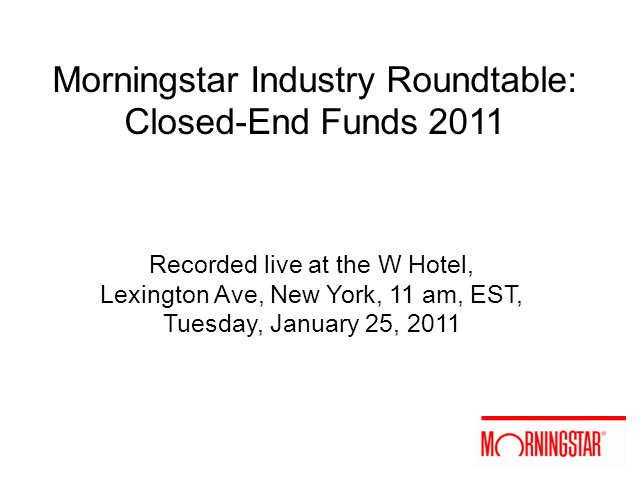 Join this industry roundtable chaired by Morningstar's Closed End Analyst Mike Taggart to hear projections for 2011, which sector will shine and what new themes will emerge that are relevant to investors and advisors today. Also joining this panel are: Tim Sullivan of Aberdeen Asset Management, Anne Kritzmire of Nuveen, Doug Bond of Cohen & Steers & Jonathan Isaac of Eaton Vance and Brian D'Anna of BlackRock. View live to interact with panelists or afterward on demand.